Hiya people! 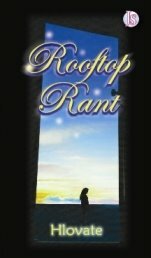 Have you read Rooftop Rant by Hlovate? If not, please, do read this book. I recommend to you guys, who are in the process of reading books. This book is actually about 16-year-old teenage girl, Khairul Batrisya Mazni which is also known as Trisy. She faced a really huge problem which turned her into a rebel. She cut her hair short, wearing shirt with skulls and Indiana Hemp artwork on it and a hypoglycemic. Then, one day, she skipped her tuition class (Don't try this at home!) and started hanging out at the rooftop. There, she met a guy,which was Jade or Mohd Zaid Mohd Tajudin, wearing a John Lennon spectacles, sketching with his Pilot Shaker mechanical pencil. To make this story short, they became best friends, ranting with each other. Inspire each other to be a better person. And they are near to their dream ; eternal happiness. Interesting, right? They got married with each other at last because they knew each other too well. Trisy : I hate the alter-ego lawyer too. Jade : Be my wonderwall? And there is these phrases which is a real eye-catching for me. Trisy : The basic definition? Lekiu : I'll try my best? Trisy : Will do. By the way, Irah can be a good friend too. By all the means of the word. Lekiu : Trisy, I seriously don't know you. Trisy : Makes the rest of us. Here you go! Don't forget to read and give your own, personal response.